If you are spending three of your vacation nights on Cape Cod, we hope you will come to quaint and historic Sandwich Village and stay with us at our Cape Cod bed and breakfast inn. With a stay of three nights, you really only have 2 full days here and the day you arrive. If you arrive in Sandwich prior to our 3:00 pm check-in time, give us a call and, if we possibly can, we will get you settled into your room. If early check-in is not possible, you can leave your car at the inn and head out to explore Sandwich and have a bite of lunch. The Dunbar Tea Shop, the Brown Jug, and the Belfry Bistro all serve lunch, each in a different and charming setting. Now would also be a great time to visit Heritage Museums & Gardens. You can have a bite to eat there also, in the outdoor setting of the Magnolia Cafe. Grab a map of the grounds and head out on one of the nature trails or visit the antique car museum. Be sure to visit the tree house in Hidden Hollow. And don’t miss a spin on the antique carousel before you leave the gardens. Another wonderful place to visit in Sandwich is the Glass Museum. Watch glass being blown and learn about the history of the village and its’ connection to glass making. Walk over to the Dexter Grist Mill located on Shawme Pond and then pay a visit to the Hoxie House, the oldest house on Cape Cod. The docents who lead the tours are worth the price of the ticket. When you return to the inn, Charlie will be happy to pour you a glass of wine and help you select a great place to have dinner. 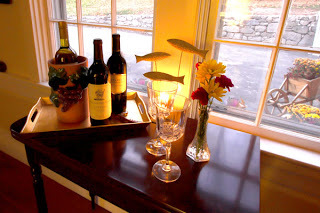 There are so many wonderful restaurants to choose from very near our inn and a couple that you can walk to. The morning of your first full day on Cape Cod, we will serve you a hearty and healthy breakfast and send you on your way with maps and information to help you have a fun-filled day. For first-time visitors to the Cape, we always suggest a drive along scenic Route 6A. This lovely drive begins in Sandwich and winds through the villages of Barnstable, Yarmouth Port, Dennis, and Brewster, ending at the Orleans rotary. Aptly named, this winding road will show you the oldest and most historic parts of Cape Cod. You will pass by cranberry bogs, nature centers, salt marshes, and through villages with old captain’s houses, antiques shops, and art galleries galore. 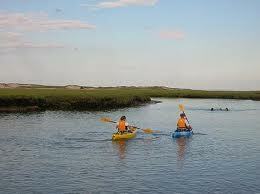 As you pass through East Sandwich, you will pass a cranberry bog on your right and near the Green Briar Nature Center. Just a bit further along, you will cross Scorton Creek. You will get a beautiful view of the saltmarshes and in summer drive carefully if the tide is in because kids will be jumping off the bridge and into the river. This is a wonderful place to go kayaking. If you have time while you are here, Justin from EcoTours will take you out for a paddle. If you have family and friends who will be expecting a gift from your trip, you will find several cute boutiques in East Sandwich, among them are the Black Crow Gallery, Mrs. Mugs, and Painted Daisies. Sandy Neck Beach is located in East Sandwich and West Barnstable. In Barnstable Village, make you way down to Barnstable Harbor. The view across to Sandy Neck lighthouse is a fabulous photo op. Mattakeese Wharf restaurant and Osterville Two fish house are both located on the harbor. Some other points of interest in Barnstable are the Sturgis Library, the Olde Colonial Courthouse, and Crocker Tavern. The old Barnstable Tavern and the Dolphin Restaurant are both right on 6A in the village. As you journey through Yarmouth Port, you may want to stop by the Long Pasture Wildlife Sanctuary and go for a walk along their nature trails. There is an amazing view across the river to Sandy Neck and the lighthouse there. Other things you may enjoy here are the Edward Gorey House and Gray’s Beach. The Optimist Café on Route 6A is a great place for lunch. The next village along Scenic Route 6A is Dennis. Near the town line is the Antiques Center of Cape Cod. This is a splendid place to stop and spend a little time. Dennis is a fairly large village compared to others along 6A and there are lots of interesting places to spend time. We love Borsari Gallery and Tea Room. The setting is killer and lunch lovely. Be sure to ask them about the building’s history. The Cape Cod Museum of Art is in Dennis as is Scargo Lake and Scargo Tower. The view from the top of the tower is wonderful. We also love driving down Sesuit Neck Road to the harbor where the Sesuit Harbor Café is located. This quintessential clam shack is one of our most favorite places to eat on Cape Cod. Charlie is mad about their lobster roll. Just up 6A from Dennis is the Village of Brewster, which is home to the Cape Cod Museum of Natural History. This is well worth the stop, especially for nature lovers. The Brewster Store is located on your left as you pass through the village and is a fun place to stop and browse. 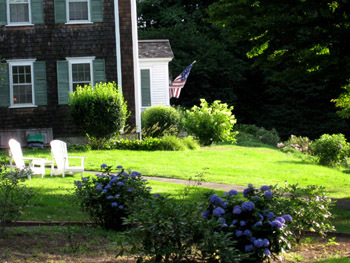 There are many galleries and small antiques shops located along 6A in Brewster. Drive slowly so that you don’t miss one in case you want to stop for a visit. As you leave Brewster traveling along Route 6A, you will come to Route 6, also known as the Mid Cape Highway. Jump on here following the signs to Provincetown. This larger roadway travels through Orleans, Eastham, Wellfleet, Truro, and into P’Town (as the Cape Codders call it). 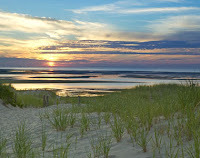 This is a beautiful part of Cape Cod, with many places to visit with more time. With only a couple of days, we suggest that you enjoy the drive through these lovely villages and move along to P’town. We suggest you take the turn-off to the Information Center as you enter Provincetown. It is well-marked along the highway and the view from there over the dunes is very much worth the detour. After all, the purpose of this suggested day-trip is to show you how diverse and beautiful the Cape really is. 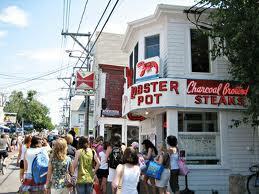 When you arrive in Provincetown, head down Commercial Street to the large public parking area near the pier. One of the great things to do in P'town from May through September is to go on a Whale Watch Cruise. The office where you can purchase tickets to the Dolphin Fleet Whale Watch is located neat the public parking lot.They even have a sunset cruise that you will love if the weather is warm and sunny. When you return from whale watching, you will have time to stroll the streets of P’town and perhaps have dinner at the Lobster Pot on Commercial Street. You can’t miss it, just look for the large lobster hanging out front. When you leave P’town, we suggest that you take Route 6 bake to Sandwich. Take exit 2 onto Route 130 and back to the Inn. You can have a glass of brandy, port, or sherry before you turn in for a comfy, and probably much needed, nights rest. 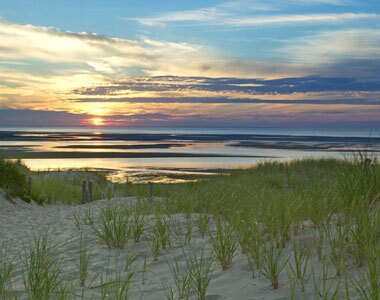 At this point, you have only one full day left to spend on Cape Cod. You will need to decide whether to take a day trip to Nantucket Island or Martha’s Vineyard. We think you would enjoy either one. Keep in mind that Nantucket is the smaller of the islands and may be more appropriate for a day trip. We have written blogs on both of these lovely islands that may help you decide which one is the best choice for you. Simply look in our blog index and click onto each of these articles. Whichever you choose, we are happy to help you make arrangements for your visit. Martha’s Vineyard is accessible from either Falmouth or Woods Hole and is only a 30 minute ferry ride. Nantucket is accessible from Hyannis via a 20 minute plane ride or 55 minutes on the fast ferry. If you are taking the 9:00 am ferry to Nantucket, we are happy to send you off with a take-away breakfast to enjoy on the ride over. Martha's Vineyard is quite large but you can enjoy a day-trip there. Nantucket is a small island and ideal for day-tripping. After breakfast at the inn on your third morning will be check-out time. For us, it will be like saying goodbye to friends. We will be hoping you experienced the magic of Cape Cod and that you will be making a return trip to stay with us and do more exploring.